Repairing a car is quite different from restoring a classic car. Repairs are made all the time on cars, this is not a restoration. There is not only a difference in repairing and restoration, but there is also a vast difference in the types of restoration. Here you can discover the different types of restoration for cars as well as the difference between simply repairing a car and actually restoring it. In "Vintage Cars – Restoration Tips From A Classic Car Junkie," you will have all of the information you need to get started on a successful restoration project. 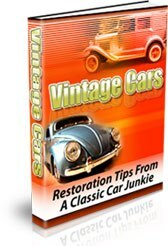 Vintage Cars – Restoration Tips From A Classic Car Junkie" will not only give you easy to understand details of what you need to restore your car, but also how to find he products and parts that you will need as well as step by step instructions on the process of class car restoration. If you have been looking for one easy and concise guide on classic car restoration, you have finally found it in this book. This PDF ebook normally sells for $17.00 but you pay just $1.00 here.